I absolutely love when my husband grows his beard out. I have been trying for years to convince him to keep it full time. He always starts in October to make sure he has a good beard for deer camp every year, then gets irritated and shaves is by the end of January. I have been asking him since he started complaining about "the itch" what I could do to help him keep his beard. He complained that he just feels like he doesn't have enough product for his beard to keep it maintained and soft. Can You Handlebar has him covered with some of the best smelling products I have smelled for men's beard. I chose to get him the dry oil in the Wisdom scent to see if I could convince him to keep the beard for as long as possible. I love the set up that I received. I thought it was great that there was a quick start guide, so if your man has not used dry oil yet they will make sure that they know how before they use it. There are multiple scents, I chose Wisdom for my husband. The scent is woodsy, with a touch of citrus. It is a little strong at first, when you are not used to it. My husband over all is in love with this product. He used it for the first time, and was so happy with the beard oil brush, how simple it is to use. We went to a few stores the first day, and he was checking himself out in the mirrors, talking about how his beard looked like it was glistening. He now is taking more time to take care of his beard. And it smells so delicious! If you would like to learn about the dry beard oil, and other great products from Can You Handlebar, please click here. One of the things I craved the most when I was pregnant and breastfeeding with all my kids was tuna. And every time, due to mercury levels that can be found in tuna, I was always told no by my doctors. Safe Catch makes sure to test all of their tuna and salmon for mercury, so you know you are safe to eat it whether you are pregnant or not. Safe Catch makes sure to test every single fish that comes through to make sure that they are not full of mercury. They are the only brand known that makes sure to test every single fish to check their mercury levels. Safe Catch does not pack their fish with oils or water, making it so much easier to use. You just have to open the pouch, or can and you can eat it just like that. I always have hated the task of trying to drain the oil or water from other brands of fish. The things that I love most about Safe Catch beyond feeling much safer to feed this to my entire family, is their great flavor choices. I received six different flavors of tuna and four different flavors for salmon. My husband absolutely loves being able to switch up flavors. We have been using them to help him switch up his lunch game. My kids absolutely love them as well. You can literally open the pouch and eat it right out of it. These would be great to throw into a gym bag, or even perfect for hiking and camping. My husband has been eating them on top of salads for a great fill of protein for his lunch. If you would like to check out Safe Catch Tuna and Salmon, please click here. Chewy.com sent me these Canidae Grain Free Dog Treats for my two furry friends to try. I always love finding new treats that are grain free for my dogs. I love that Chewy.com always has great prices and delivers them right to my door. It is so much easier to do the research online when buying new treats for my dogs, rather then reading the backs of all the packaging inside of the store. My dogs now recognize when a Chewy.com package comes, and both of them get so excited. I think my favorite part of Canidae Grain Free Dog Treats is they snap easily apart. So if you are treat training with your dog, you don't have to use so much of the treat. They also don't make that huge mess like other treats do. My dogs both absolutely love them! If you would like to check out Canidae Grain Free Dog Treats, and other great products from Chewy.com with fast shipping, please click here. Chewy.com sent me some Winter Pine Scented Cat litter to check out. I love to have my home theme scented through out the year, so seeing Tidy Cats Winter Pine scented litter, I knew it was a must have for my home. Being the owner of multiple cats, I love knowing that Tidy Cats litter is always able to keep up with the three of them. The first thing I did when I opened my box from Chewy.com was open the box these two jugs of litter came in, and just smelled it. It has a faint pine smell. Something that isn't going to be to overwhelming for your furry friends, but also something that you will enjoy the smell of. Tidy Cats has always been one of my favorite brands of litter, I even remember it being what my family used when I was a kid for our feline friend. And I love how fast Chewy.com can have it shipped to your door. No more running out to the store at all hours of the night, in all bad weather because you forgot you were out of litter. And with their great reminder emails, you won't even have to worry about remembering anything anymore. With Chewy.com you are not toting around twenty pounds of litter on the ice, because it is right at your door. Make the delivery man do the hard work. If you would like to check out this and other great products from Chewy.com, please click here. I have been searching for years for a decent white noise machine. I have a lot of problems sleeping. What I have noticed, a lot of these machines are insanely priced, and they typically are all just recordings of sounds. The AuCuTee White Noise Sound Machine is the perfect no nonsense white noise machine. This machine is well priced, so you are not breaking the bank to just get a good nights rest. There is a fan that runs on the inside of the machine, so you can get that fan noise that people like myself really appreciate. All while not having to be freezing on a cold winter night from the fan blowing ice cold air at you. It does take a few minutes to warm up, but not long at all. If you would like to check out AuCuTee, please click here. I received this foaming shampoo and body wash to try out. I used this on both my kids with no issues. Typically when we get items that say tear free, it is definitely not tear free. Which can cause so many issues in the bath tub. I had my four year old washing himself up, while I helped my two year old. My four year old ended up with some in his eyes, but with no crying. He said he was completely fine. It doesn't have an overly strong scent. This is PHTHALATE FREE, SODIUM LAURYL SULFATE FREE, PARABEN FREE, TEAR FREE, PH-BALANCED. To find more about Susan Brown's baby products click here. Since the beginning of the school year, we have actually been using our front door a lot more to get in and out for the bus stop. Typically we use our back door because it goes into the kitchen where I don't have to worry as much about a mess on the carpet. But, now with the school year and lovely winter coming in I needed something more then ever to have people wipe their feet before they step foot into my house. This Floral Welcome Non Slip Coir Doormat came, and I was beyond amazed! This rug is perfect for in front of any door. It is 17" x 28" and is .5" thick. Made with coconut fiber it traps dirt very well. I love that there is a little bit of thickness to it. I have had thinner welcome mats that I have lost during thunderstorms in the summer. The kids absolutely love to wipe their feet on this, and my neighbors love it. I love that it is hand stenciled with eco friendly dyes. And it is so easy to clean, sweep, shake or vacuum and it will look good as new. If you would like to check out this great welcome mat, please click here. 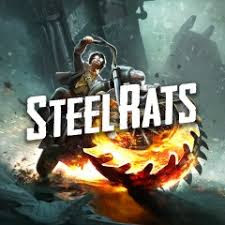 If you would like to check out Steel Rats for yourself, please click here. In my life, I have had four kids. When my first two were babies I only had the clip on baby carriers, and my son almost fell out of one. So that went into the garbage, and I never wanted to use one again. That was, until I had my youngest. I had two kids under three. And we love to walk around. The woods, flea markets, stores. Anywhere. But, putting two kids in a cart, terrible. Double strollers, well they should require a test and licensing to be able to push them because they are so big. So, when my youngest came into this world I knew it was time for a carrier again. Because of what happened years prior, I refused to get a clip style carrier. My option was a wrap. I was so intimidated with how to use one of these wraps. I spent hours watching videos, and using a doll trying to make sure I had it right. Once I finally got comfortable with my very first wrap, I was in love. Now that I am a wrap lover, I am always out to find the best wraps. Milk Snob has the softest wraps for you and your little one. They come in a gorgeous colors and patterns. And what I absolutely loved, Milk Snob has a booklet that shows and explains step by step how to use their wraps properly, so you don't have to be worried that you wont have it right. I received the Lumberjack print wrap from Milk Snob. I am absolutely in love with it. I was not only impressed with their quality in wraps. The pattern is beautiful, and unlike what I have seen in the big box stores. And the booklet was so cool in being able to see exactly how to do everything. Really helping a mom be at ease with first use. Using the wrap was great. There is enough fabric for you to be able to use it if you are bigger, without having to worry that you won't be able to tie it correctly. And showing you three different simple carry styles, you will be sure to find one that will be most comfortable for you. If you would like to check out the Lumberjack wrap, and other great products from Milk Snob, please click here. My boys absolutely love stacking bricks. So when I came across BrickMates, I was absolutely in love with them. These great stem toys have different styles for different ages as young as three. And with them being set up like a puzzle, they are easy to keep your kids interested. BrickMates takes building bricks and brings them into a puzzle so your child can build a 3D puzzle, while playing with the building bricks. BrickMates has puzzles with much larger bricks that are easier to use for children as young as three years old. The picture has how many bricks need to go in each spot to make the picture correctly. Which I really love for my kids, since they are not only having fun, but are using their math skills. I also love that BrickMates has a storage bag that zips, so you don't have to worry about bricks being misplaced, or even worse.. STEPPING ON THEM! Both of my kids absolutely love these. I love that is also comes with a snap on wall hanger, so you can hang your little ones 3D artwork up. If you would like to check out BrickMates, please click here. My husband and I love playing different games together. And The Jackbox Party Pack 5, is great game to play with up to 8 players. The great thing about The Jackbox Party Pack 5 is that you don't need multiple controllers to be able to play. Additional players may use their smart phones, computers and tablets to play along with the game. This a new take on the old classic, You Don't Know Jack. With four different games included, you can play alone or with others you are sure to have a great time. This is available on multiple systems so you are able to enjoy. If you would like to find out more about The Jackbox Party Pack 5, please click here. Finding things for my boys to do that are fun and interesting that are not electronics can be so hard to come by. I remember what a craze Rubik's cubes were when I was younger. And they have made a fantastic comeback now. Winning Moves Games has a fantastic selection of Rubik's cubes for you and your loved ones to keep their minds occupied. This Rubik's Junior Bear is fantastic for little ones to be able to make an attempt at a Rubik's cube at such a young age. It is rated for ages four and up but my three year old had no problem moving this super cute bear trying to match the colors. It is much easier then a regular Rubik's cube. Yet still challenging, especially for younger minds. This Rubik's Tactile Cube is a 3x3 cube is a new take on the classic Rubik's Cube. Each color has a different pattern on it, so you now can solve this puzzle cube with your eyes closed. I gave this to my five year old to mess with, and I love that he can do it with his eyes opened and closed. These Rubik's cubes are much different then the ones I grew up with. I remember kids attempting to peel the stickers off and put them elsewhere on the cube. You can not do that with these ones. If you would like to find out more about the Rubik's Junior Bear, please click here. If you would like to find out more about the Rubik's Tactile Cube, please click here. If you would like to check out all of the awesome things Winning Moves Games, please click here. Music has always been a huge part of my life. It has helped me get through some of the toughest situations in my life. Even now, after my kids go to bed I will put some headphones in, and listen to some music to help me decompress at the end of a long day. So having a great quality set of earbuds is very important to me. I thought I had owned great earbuds, but when I got OOMO earbuds and tested them out, I don't think I have ever found earbuds with better sound quality. These 3D immersive earbuds provide clarity using a 3 cavity, 5 channel acoustic sound structure. I have never had a pair of earbuds that sounded as crystal clear as these OOMO earbuds. If you are a gamer, or have a gamer in your life, these are the perfect earbuds for them. They will help you pin point the direction of each sound of the game. These are also perfect if you are traveling, they come with a cute and so handy carrying case. OOMO comes with three different ear pad sizes to accommodate any size ear comfortably. These come with a built in microphone, and come in black and red. These come with the standard jack on them, so they are universal to your needs. With almost a four foot cord, OOMO will make sure that you are able to be comfortable while using their ear buds. If you would like to learn more about OOMO, please click here. My Saint Bermastiff, Diesel is almost two years old. It has been a very long time since I had a puppy that absolutely loved all things toys. We play fetch every single day. If he had it his way, he would play all day every day. He even plays constantly with himself. He is constantly trying to bring sticks into the house, and it drives me bananas. I have been searching everywhere for a safer alternative for him to play with. Especially inside our house. DOOG Stick Family Fetch Toys are a great and much safer alternative to your dog using a stick. I love that these toys float. Finding something for Diesel to play with in the pool in the summer can be so hard. He has ruined so many pool floats thinking we were playing fetch when we are just tossing them back into the pool. I also love that these Stick Family Fetch Toys are not only super cute, but have the best names on them. They include a piece of rope on them, making it so you don't have get your hand covered in doggy slobber to be able to play with your fur babies. Not only did Diesel love these toys, my boys loved being able to play with the dogs with them. I also think it is great that they come in two different sizes so your little dogs can have something to play with as well. DOOG also sent me a step in harness for Diesel. Now, here are some honest facts. My entire life I have owned dogs, big and small. I have never had a dog pull me as hard as Diesel. Over the summer he had took me down a few times, and I have been looking into harnesses ever since he took me down a few times. I will be honest though, I have always been very intimidated on if I could actually get Diesel to allow me to get a harness on, as well as have it put on correctly for him. Thankfully, DOOG has great harnesses. They are super easy to use. The first time I put Diesel into his harness, it took me just a few minutes of working with him to let me get it on. It is labeled for you to know whether you need to put it on his left or right side. It only took a few minutes for him to adjust. I then hooked him up to his leash to see if I could better control him. Even though he isn't fully grown yet, I need him to be able to be controlled on a leash before he gains another hundred plus pounds on me. I was amazed at the difference. 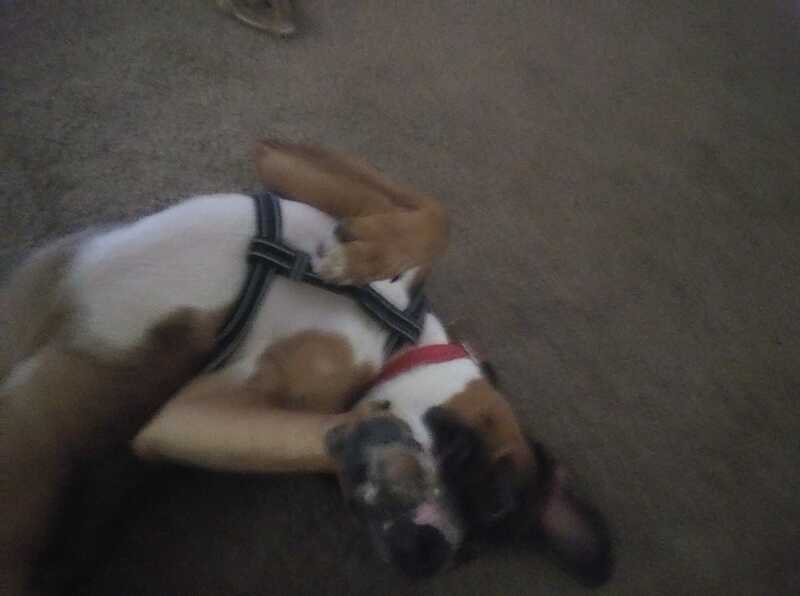 He started prancing around the house with his harness on, and didn't want me to take it off. This will make walks with him so much easier. They have a great selection in different colors and designs, and even carry matching leashes. If you would like to check out these great products and many more from DOOG, please click here. In my house, popcorn is typically the snack of choice for at least two of the people here. My husband and oldest son could eat popcorn every day, all day without hesitation. I, personally, prefer the sweeter popcorns. While they prefer savory flavors. So I was so happy when we were able to try out a variety of different popcorn flavors from Gary Poppins. My husband first tried out the white cheddar jalapeno, while I tried the caramel cheddar kettle. I tried one piece of his first bag. I am not personally much of a jalapeno lover, but this wasn't to bad. The jalapeno flavor was there, but not over powering. The caramel cheddar kettle had the best mixture of salty and sweet. The kettle corn is perfect. The caramel corn is probably some of the best I have ever had. And the cheddar had so much flavor. I loved that I did not run into a bunch of hard kernels in the bag. There was no weird after taste or film in your mouth like I have experienced with other brands of pre made popcorn. Simply delicious. They are family owned and operated. Handcrafted, one small batch at a time. We have now tried all of the flavors. My boys have even gotten into the popcorn. And kept wanting to go back for more. The size of the bags are the perfect snack size for anyone. I absolutely love Gary Poppins Seasonal flavors. They are the perfect sweet treat for anytime. And so much less guilt. I also love the fact that Gary Poppins bags are now resealable, to help you keep your popcorn fresh for a longer period of time. Though, it can be hard to stop eating it once you start sometimes. If you would like to check out the Gary Poppins website, please click here. I love candles. Absolutely love them. I love being able to make my home smell delicious just by using candles. I have always tried to find great candles, but in store in can be hard. I absolutely hate when you buy a candle, bring it home and light it. Then all of a sudden you are seeing the soot burning off the candle. No one loves seeing that mess on their walls, or going into their lungs. So, when I don't know much about a candle brand I do get nervous. A lot of the candles I end up picking up at the store, they smell great in the jar. Then you get them home and light the wick, and you can only smell the candle when you are within a few feet of it. My house is 1600 square foot roughly, I have it lit in my kitchen currently as I type this, and I am on the complete opposite end of my house, and I can smell it just fine. Now, I will say, no matter where I am at, I can smell it. But, if I am in the kitchen with it, it is not overbearing. Apple scents are my favorite scent over all. And this smells like there is a fresh baked apple pie all through out my house. Goose Creek Large Jar Candles will burn for 120 to 150 hours. The wax is a premium paraffin. These are made with lead free wicks, and have a clean burn. If you would like to check out this scent, and other fantastic scents for anyone from Goose Creek Candles, please click here. My entire relationship with my husband he has done a job that requires him to do a lot of strenuous work. He will come home five to six days a week with so much pain in the back. I end up giving him so many massages it is unreal. But they do not always help. We are really trying to steer as clear as possible from pharmaceuticals. We started researching different more natural options that we could use. And came across CBD Daily. This intensive cream has not just a great aroma, but my husband swears by it. I have been using it on his back daily since we received it. And he says he feels so much better. This also really helps keep your skin very moisturized. Leap Bunny Certified, and Non- Pyschoactive. Earthly Body also has a Miracle Oil that you can literally use on all your ailments. This all natural oil can be used rather then triple antibiotic ointment or bactine. Containing nine natural oils which include hemp seed oil, as well as tea tree oil. This oil is also THC free. I have actually been using it on my cuticles with this winter weather in Michigan, my hands are the first thing to dry out. This has helped keep moisture so well in my hands. Any anything there is a minor cut or scrap, which lets be honest here. I have two boys that are beyond rambunctious, and with the weather, they are stuck inside A LOT right now. Which means that more and more accidents happen. This has helped them so much with healing not just faster, but healing without scars. My husband has been loving it on his razor bumps he gets when he shaves. This literally has a limitless amount of uses. If you would like to check out Earthly Body, please click here. If you would like to check out the Miracle Oil, please click here. And if you would like to check out the CBD Intensive Cream, please click here. Every nursing mother would agree that finding a nice breathable, not awful looking cover makes everything so much better when you are nursing around company, or in public. I am sure that they would also agree that they would like to pack as lightly as possible, so multi-functional products work best. I have found Covered Goods, which is a company that makes four in one nursing covers! These products give you full all around coverage when nursing, which is so much better then the traditional apron style nursing covers. I hate when I am nursing and my children kick around and end up exposing me. I am sure every one around me hates it as well. They also come in the cutest print options, I received the Happy Panda Print, and I am absolutely in love with it! You can get an assortment of prints, and even solids and stripes. The fabric is very soft, breathable, and stretchy so it will still be comfortable for you and baby. And when you are finished you can easily fix yourself without to much fuss, and place baby into their car seat for a nap. And easily transfer the cover over to the car seat so you don't have a bunch of people trying to touch your precious angel while they are trying to sleep off their milk induced coma. I love that this product can be used in so many ways, and more then just for baby. It is very high quality, while still being affordable. If you would like to find out more about this print and many more beautiful prints from Covered Goods, please click here. I am constantly looking for snacks that I can take on the go for my kids. We do a lot of traveling and have a lot of long doctors appointments. They are even great just for an anytime snack. So when I was able to check out Organic Slammers, I was super excited. My kids were even more excited when they seen the boxes on the counter and were ready to try them out immediately. I gave them the Pomegranate Grape Crush, which has 7 grams of Protein per pouch. The flavors in this pouch are: Grape, Pomegranate, Coconut, Apple, Banana, and Purple Carrot. I want to be completely honest. Because of my lack of reading before giving them to my boys, they were not super impressed. These ones taste WAY better if you refrigerate them. Once they were actually cold, my boys both liked them. My only personal downfall is I had to tell my oldest that he had to ask me before getting this particular one because he needs medication to have proteins. But, that is just me personally. I tried this one too, I could really taste the grape, and a hint of coconut. It wasn't bad at all cold. These have been helpful on the days that my oldest is not wanting to eat anything but fruits and vegetables. I gave each kid one of each flavor to try. They both have their favorite flavors. Awesome, is a mixture of: Bananas, Blueberries, Strawberries, Beets, Acai, and Amaranth. This one both my kids loved immediately. I tried some of theirs just to test it out. And it really was delicious. You don't taste the earthy flavor of beets at all. It just taste like a fruit sauce. My youngest son who is two actually favored this flavor. The last flavor we received to try out was Amped. The flavors in this pouch are: Apples Strawberries, Cherries, Chia and Purple Carrot. My oldest LOVES this one. He tries to sneak and get them. And at four has now figured out how to open them alone. I am completely fine with him grabbing for a Slammer Pouch, verses candy or junk food he could be going for. My younger son also enjoyed this flavor. He is just not as much as an apple lover as my oldest. These have been great for on the go morning snacks. My five year old if he gets up in the middle of the night, and wants to find a late night snack. (It is really five in the morning, but we try to tell him it is still the middle of the night. In hopes to get just a little bit more rest) He has asked for these. I wouldn't leave them in your car in extreme heat or cold, but throw a few in your diaper bag, or take them when you know its going to be a while. The pouch is great and causes much less mess in your car or out and about. If you would like to find out about these flavors, and other great flavors from Organic Slammers, please click here.